Man, what an awesome first line! It sets up the mood, theme, and direction of this book perfectly! After a line like that, my expectation was that this book would be a post-James Bondian mission. Like, what happens *after* a mission takes place and the hero reports Mission: Accomplished. Well, this is definitely not a post-Mission: Accomplished spy thriller. More like, Mission: Hasn’t Ended Yet. And, oh yeah, it’s not just about the mission. Nick, a soon-to-be-retired CIA operative and the hero of this story, makes it home from a mission in Brazil, but unfortunately, his “work” didn’t quite stay there. Needing to find safety, he thinks of the only person with whom he’s found a semblance of peace: Lillian Love, now owner of the Monarch Inn. The Monarch Inn is nestled in West Virginia, and named for the monarch butterflies that migrate through that area on their way to Mexico. At the Monarch, Lillian Love and her son Devan run the business as best they can, quietly living their lives. When Nick stumbles back into Lillian’s world, his presence soon shakes up their seemingly-peaceful bubble. Illusions of a perfectly happy and normal life are challenged, as these characters discover strength in unlikely circumstances. Through Lillian, and Devan, I discovered the emotional depth of what could have been a superficial action tale. They told the narrative with Nick, alternating in a three-person perspective. Each voice is unique, and paced really well throughout so that the tension remained tight. Though I expected a plot driven, action packed story (I’m a Die Hard kind of girl, yippee-ki-yay! ), it was the unexpected character driven multiple perspective storyline that won me over. (In fact, though I’m a fan of the action and story in Brazil, I actually preferred the scenes at the Inn, especially Devan’s perspective.) Getting into these characters’ heads gave such a satisfying depth to the story and steered it away from being generic. Nerd Point: I ate up the science facts about monarch butterflies that the author gave in the beginning of the book. It threw me off at first, since notes of that nature seem to come at the back of the book, with other acknowledgements and appendices, but looking back, I liked it, because it kept me in the mindset of these butterflies, how they persevere despite all external odds against them, and how they’ve endured, despite all scientific logic. They are truly worthy of being the symbol to represent the spirits of revered ancestors. I think it’s with that mindset that I was able to sympathize with the characters more. They have come to realize that they are stronger than they appear, and can hope for a brighter future despite all logic and odds. I invite you all to chat with the author, Michelle Davidson Argyle TONIGHT (9/15) at 9PM EST. The chat will be hosted by Annie Cechini on her blog, conveniently found HERE. During the chat, you’ll be able to participate and be entered into a drawing for a free copy of Monarch. Hope to chat with some of you tonight! 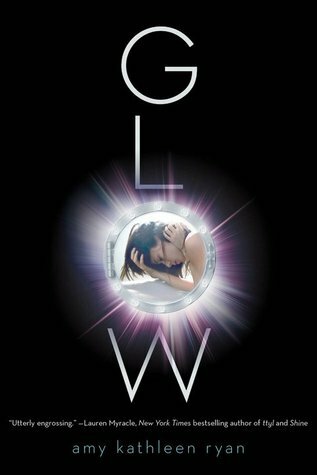 Speaking of giveaways, my wonderful friend, Carol Miller is hosting a giveaway of GLOW. Much anticipated by me, since I love scifi. Click on the pretty cover image to get to Carol’s giveaway!! Also, there’s a banner on my sidebar linking to Regina Linton’s blog, who is hosting a giveaway for it, too!